Often, when I feel the need to visit the desert (which usually means an overnight stay at least), and I don't have a lot of time, I will set out for Desert Gardens. More or less, depending on what I see to distract me, the walk from the end of the blacktop takes about an hour. Often I arrive just after dark. If I am lucky, the moonlight lights my way as I find a campsite and set up my tent. One evening, I unpacked the piece of chicken I had bought at a deli that afternoon for my supper. In the darkness an owl suddenly appeared. When he realized that I was attached to the chicken, he halted in mid-flight and quickly changed course. 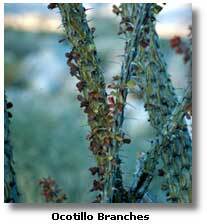 Desert Gardens is a lovely garden of ocotillo, cactus, and other desert plants. As with any garden, the thing to do is to walk around and look at the plants which often include a stray wildflower or two at the base of the mountain ridge. Sometimes you may find some birds, animals and other creatures, too, such as the scorpion I photographed one afternoon while it was crossing the jeep trail. 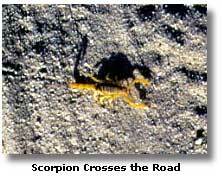 While I would not recommend touching one, the scorpions in Anza-Borrego Desert State Park are not known to be poisonous. I drove to Desert Gardens late one afternoon not long ago intending to spend the night. It was very windy, and there were dust clouds in the air. There must have been insects in the air, too, because I observed a couple of nighthawks trying to fly against the wind and apparently also finding bugs to eat. Scenes like this, with birds or animals struggling to find something to eat out there, only increase my respect for any creature who can call the desert home. You can reach Desert Gardens by walking the soft sands of the jeep road, or you can perhaps find firmer footing if you take a straighter and shorter path merely by walking straight across the desert. The trailhead for the Alcoholic Pass trail, another recommended walk, is in the southern end of Desert Gardens. Ocotillo Flat is not a place to just pass through. It is a place in which to wander. Unless you are using it as a route to Lower Willows and Box Canyon, you should not have to be in a hurry. Each visit is different. I like to enter Ocotillo Flat somewhere between Desert Gardens and First Crossing and look for something that grabs my interest on that particular day, and to follow it. 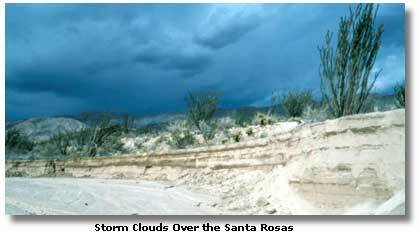 It may be a way to step out of the storm-widened creek bed into the fields of cactus and ocotillo. It may be a way to follow a wash up to the barren hills to the north and east. Maybe it will be to follow a bird or to look for lizards. That sets the wandering in motion. From then on, I always seem to find one objective after another. In winter, I might see a chuparosa plant being fought over by a couple of hummingbirds. On a warm day in late spring, I might encounter a chuckwalla, sitting patiently in the sun while I lift my camera to my eye and focus its lens on him. Maybe I will just decide to walk in a wash, or on the ground above it, because I decide I like the way it looks. Ocotillo Flat starts at Coyote Creek and stretches across soft sandy soil to the naked hills and canyons to the east and north. 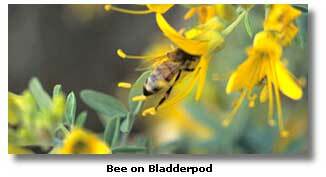 It is bird country, reptile country, and cactus country with wildflowers in season. 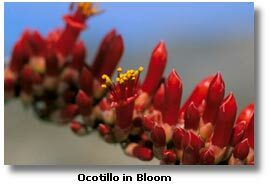 It includes one of the most impressive stands of ocotillo anywhere. The cactus wren, the largest of the wrens with a spotted breast, is likely to be found here among the cholla and other cactus. It's easy to step on cholla. This plant propagates when the wind blows off spiny little pieces of it a few inches long. A hiking and riding trail weaves through Ocotillo Flat. Sometimes I take it, and sometimes I strike out on my own. Some days I will walk close to Coyote Creek where there are plants like mulefat (baccharis viminea), which the Cahuilla used to retard baldness. On other days I will work my way up to the mountains and canyons and try to imagine Cahuilla hunters lurking there, trying to bring down unsuspecting jackrabbits. 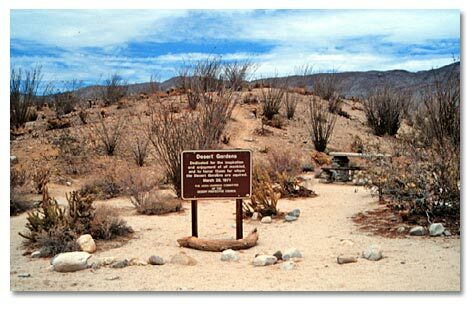 The place is full of Cahuilla Indian history, most of it unfortunately lost to us. Archaeologists have been able to determine that arrowheads were made in the canyons at the base of the mountains. Visitors today can walk along the northern reaches of Ocotillo Flat and see where ocotillo was planted close together to form a fence. It isn't certain whether the purpose was to keep cattle in or animals out. In navigating through this area, I always find the gauging station (a little sand-colored block house with an antenna on it) to be a good landmark. It's at Second Crossing. Another landmark is the place where the west-side mountain spills into the valley just north of First Crossing. Somewhere between the two crossings, Coyote Creek goes under ground, unless it is just after a storm and the creek is full. Desert willow, which produces a long and pretty pink flower, is one of the many shrubs that grow densely along the creek bed, providing cover for such birds as the little gray verdin and snipe (which look like misplaced coastal shorebird). I have also noticed a roadrunner or two in this area, perhaps looking for rattlesnakes, one of the bird’s favorite meals. 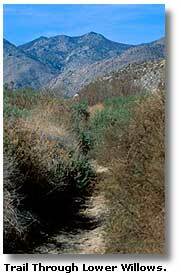 The soil in Ocotillo Flat is called alluvium. Alluvium is the sand, rocks and gravel that rainstorms wash from the mountainsides to the desert floor. 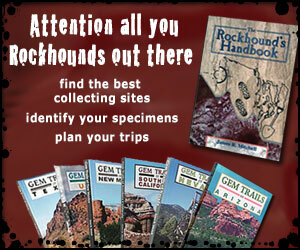 Alluvium deposits are generally soft, or unconsolidated as the geologists like to say. Unless the alluvium includes clay, the rocks, gravel and sand haven't stuck together to the point where you or a little ground animal can't dig in them. It's common to walk through areas of alluvial deposits and find yourself plodding through sand or other loose soil. It is also common to come across patches of ground that are full of small holes more or less about as big around as a golf ball, or a rat's body. You step in ground like this, and it could give way under your feet. When you walk in such country, it's a good idea to wear boots for the ankle support they provide. The attractions of Lower Willows are the fresh waters of Coyote Creek running through it and the color, density and variety of the surrounding vegetation. What more would you like? In some places, the vegetation is so dense it is impassable, unless you were to cut your way through, which is, of course, illegal in a state park. Lower Willows attracts birds and animals, and it attracts people. I don't consider a year to be a good year unless I have been to some part of Lower Willows at least once or twice. The birds and animals drink the water of Coyote Creek. Mourning doves and quail scratch around looking for seeds to eat. The phainopepla (a cheerful crested bird  the males black, the females gray) feast on the colorful berries of the mistletoe, a plant-killing parasite. The phainopepla, flying to other plants, carry the mistletoe seeds, depositing them in their droppings, producing more mistletoe. 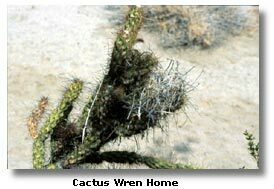 Cactus wrens nest in the cactus and ocotillo. 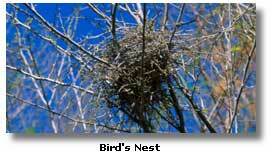 It's easy to spot old nests. Phoebes search for the insects that are attracted to the water. Loner birds like the Virginia rail and the sora inhabit the thickest part of the willows where they are seldom seen but frequently heard. Coyote Creek flows down from the Santa Rosa Mountains. Leaving the Collins Valley, it flows through a narrow space between two ridges. This is a very green area full of trees and shrubs like the desert willow, hence the name, Lower Willows. It is joined here by small creeks that start in places like Salvador and Cougar canyons. Downstream, the willows and other plants grow densely along the creek for more than a mile. Coming up from the Borrego Valley on the jeep road, you may not notice them where the creek skirts Ocotillo Flat. People who follow the jeep trail don't notice the willows until confronted by them at Second Crossing. I often prefer to leave the jeep trail at First Crossing and follow Coyote Creek upstream. Finding Coyote Creek is a bit of a trick because the creek water as it flows toward Borrego Valley eventually is absorbed into the sand, but you never can be sure exactly where. If you are there after a recent rain in the mountains, the creek water could flow all the way to First Crossing or beyond. I walk from First Crossing along the route of the Ocotillo Flat riding and hiking trail, but where the trail turns toward the hills, I cling to Coyote Creek. Down where the creek ends, it is easy enough to walk in the shallow water, assuming your boots are leather and not canvas. The water gradually becomes deeper and the willows, cattails and other plants become more dense as I move along, and I move to the creek banks. In a dry year, with a poor spring for wildflowers, I can almost be sure to find at least a few flowers along Coyote Creek. On one Saturday visit in such a spring, the plants I saw included some large examples of Brittlebush (Encelia), one large Arizona lupine, a few sand verbena and brown-eyed evening primrose. 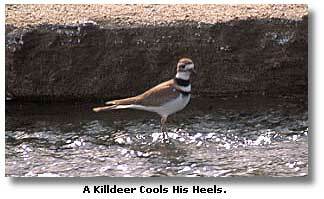 I also encountered a pair of killdeer enjoying the cool water of the creek. Killdeer, shorebirds who are known to enjoy golf courses, are regular residents of Lower Willows. The closure of the jeep trail at Ocotillo Flat just below Third Crossing gave me the opportunity to walk into the Third Crossing area and enjoy it for a full night all alone. I camped about thirty yards from Coyote Creek. The night air was full of the quacking of frogs and the trilling of toads. At one point they seemed to quiet down, and then they started in again. A coyote howled as he walked by, I assume after just having killed something. At daylight, it was a pleasure to look at the morning glow in the eastern sky. Later I saw a sleepy-looking phainopepla, belly full of mistletoe berries, perched on a high naked branch of a catclaw. I came across mourning doves, birds that always wait until I am just a few feet from them before they start squeaking and beating their wings and flying hurriedly away, always managing to scare the hell out of me. In the 1990s, heavy rains caused Coyote Creek to go wild. For several years previous, the creek had been meek and gentle. The banks beside the creek bed and the creek itself afforded space for walking. But after the rainy years, the foliage grew more dense and the water more intense. Walking through the thickets of Lower Willows, about Third Crossing, became more of a challenge. While horseback riders could remain in the creek as they always had, walkers escaped the wettest part of the walk by taking a steep cliff-side trail. When I followed this trail, I noticed that instead of putting me into the thick of Lower Willows it put me outside of it where I could enjoy a broad overview. From somewhere down in the middle of the willows, I could hear water splashing so I knew Coyote Creek was there. I also made a mental note that if I ever decided to try to backpack in the Collins Valley by way of this trail I should carry a pack that attaches tightly to my body. The trail is steep one. Soon the cliff trail led me down to a broad and sandy plain beside the creek where the plant obstacles were not so bad. Undoubtedly, this is one of the prettiest areas in the park. But soon the trail brought me face to face with the creek again. I saw no other way to get to Collins Valley but to walk into the creek. Fortunately, I came prepared. I unzipped the pantlegs from my pants, and I removed my boots, changing to rubber sandals. Then, I was ready. Or so I thought. At first, it seemed perfect. It was me against the creek, and I had won. Or did that toad who growled at me as I passed his hiding place in the rushes know something that I didn't? All was fine and beautiful for a while. I enjoyed the sound of the brook, the splashes of dappled sunlight here and there, and the plants, especially the green clover that grew next to the creek. In one pool, there was even a plant that grew on the water. When I reached the place where tributaries from Cougar and Salvador canyons reach the stream, I began to notice that with each step I took the mud (which was soft and becoming deeper and deeper, reaching my calves) seemed mor e and more reluctant to release my feet and sandals. I began to struggle. Then, a misstep caused me to lose my balance and I fell over backward, landing on my rear in a puddle. Thus began a battle between the mud and me that would continue until I stepped out of the willows and into the Collins Valley. By that time, I was carrying not just my boots but my sandals as well. They and my feet and lower legs were covered with the soft black mud of the creek. I don't know the content of the black mud, but it rinsed off easily when I finally got to where the creek water was clear. Near the end of the trail, I caught up with a trio of tired-looking young men, one with bleeding legs and feet. They wanted to know how far it was to the end of the trail. I pointed across the top of the mesquite to the tall flat-topped mountain to the west. "We're just about there," I told them. "That mountain stands above Cougar and Indian canyons. It's a landmark."